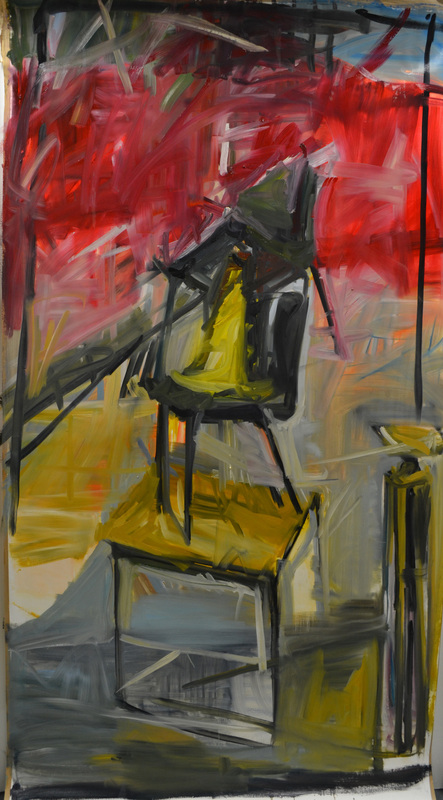 Chair, 2015, 140 x 140 cm, oil on canvas. Male 1, 2016, 140 x 80 cm, oil on paper. Untitled (Nottingham) 2017, 140 x 140 cm, oil on paper. Messenger, 2012, oil on canvas, 40 x 30 cm. 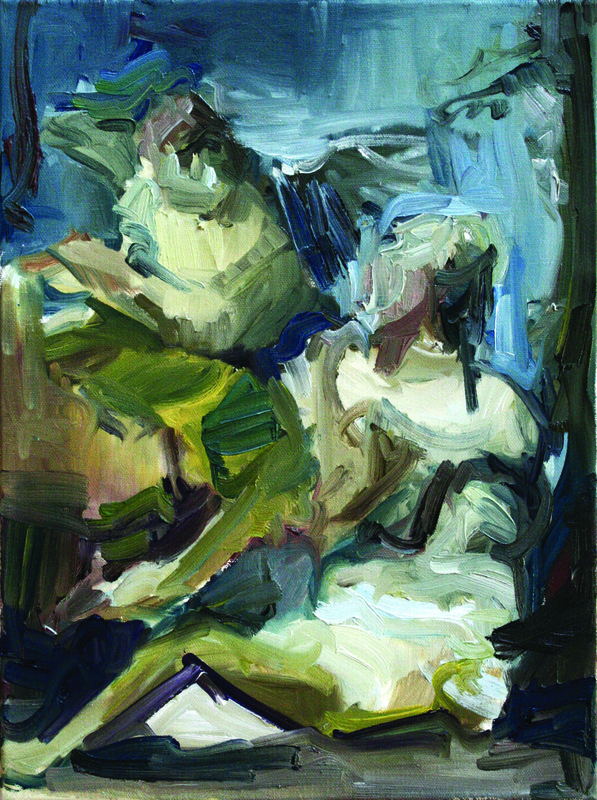 Mother and son, 2012, oil on canvas, 35 x 24 cm. 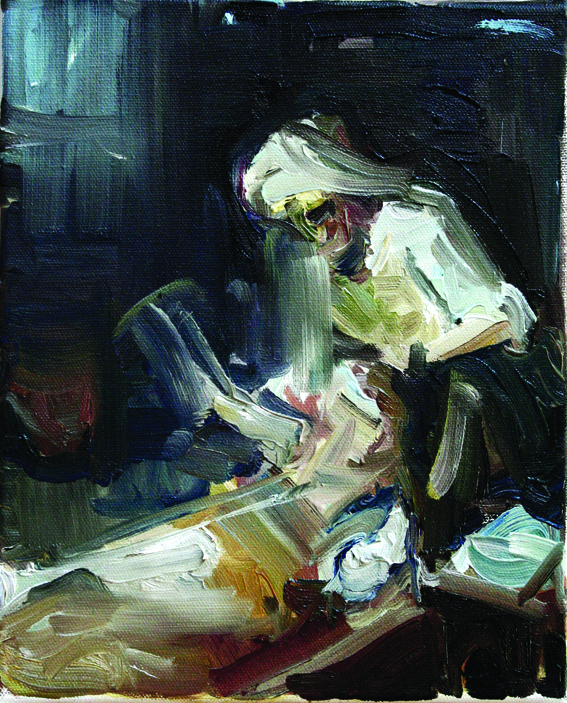 Break IV, oil on board, 2012, 25,5 x 19 cm. Studio 4, 2016-17. 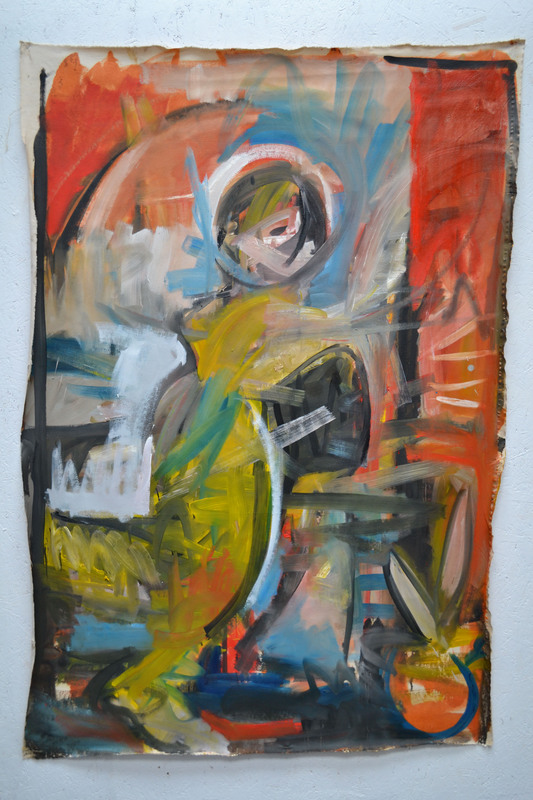 210 x 140 cm, oil on paper. 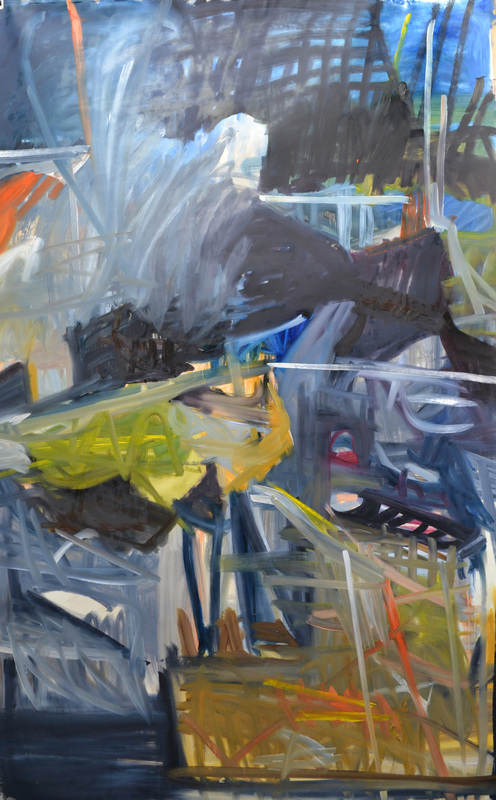 The paintings in this group show an overtly expressive style, an emphasis on the surface and ‘heavy’ mark making, seemingly in contrast to a clear ‘canon’ or classical system. 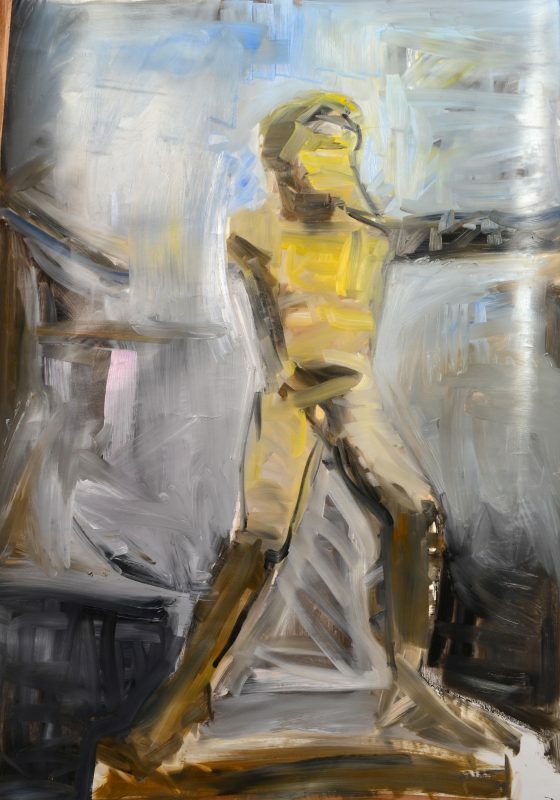 The paintings are influenced by Greek sculpture and challenge the clear recognition of the motive, sometimes obfuscate it, and defy technical and stylistic models. ‘Perfect’ proportions and a balanced and measured response are countered with the focus on the canvas surface, instead of the representation. Exhibition View. PENG Mainz. Germany Oct 2017. 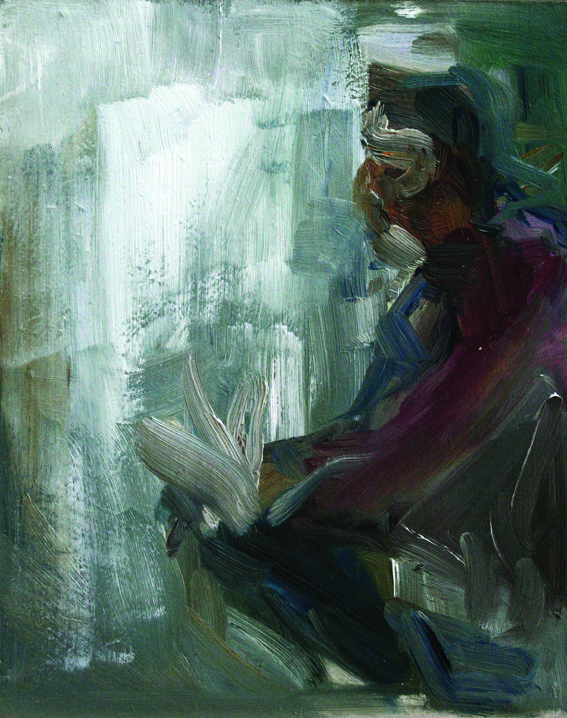 Shepherd, 2012, oil on canvas, 30 x 40 cm. Children, 2012, oil on canvas, 30 x 40 cm. Girl, 2012, oil on canvas, 40 x 30 cm. 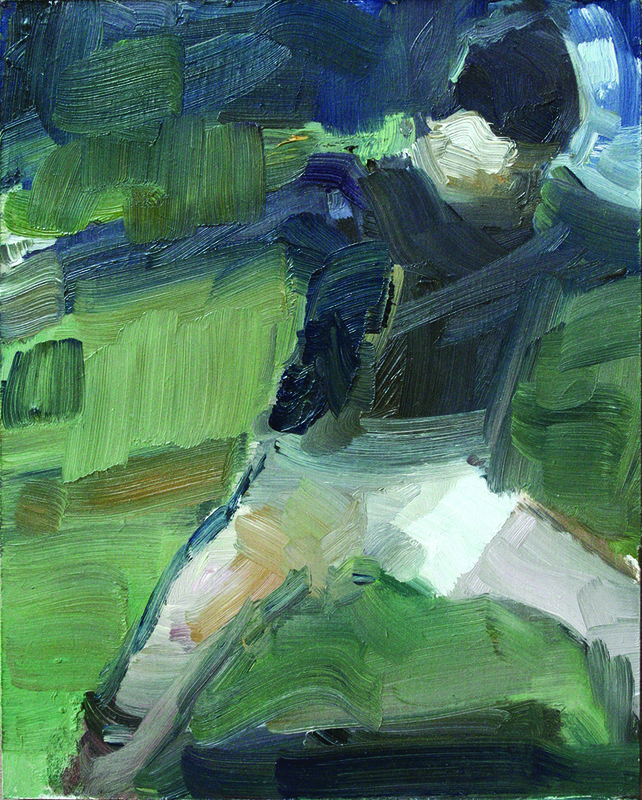 Play 1, 2011, oil on board, 25,5 x 19 cm. This body of work focuses on the idea of erosion more broadly, extending the scope onto city environs, art historical images and found, arbitrary objects. In his paintings the idea of shifting and depositing of pigments and image-fragments becomes a key concern in his work. This allows Christian Mieves to explore the conceptual resonances of some of his earlier work and to develop a new trajectory for his artistic practice. For the purposes of this project, erosion is defined as that set of processes by which surfaces are worn, thinned or marked. It will be observed both on a formal ‘painterly’ level (the breaking up of the image surface), and more broadly in the decaying or disappearance of the object. Object 1, 2011, oil on board, 19 x 25,5 cm. Formation 3, 2011, oil on board, 19 x 25,5 cm. Formation 5, 2011, oil on board, 25.5 x 19 cm. Group 1, 2011, oil on board, 19 x 25,5 cm. Kinder 2, 2011, oil on board, 19 x 25,5 cm (detail). Kinder 1, 2011, oil on board, 19 x 25,5 cm. The body of work in this section explores some of the ways in which it becomes possible to create after devastating destruction. Paintings such as grumi di merci 1 (2008) and grumi di merci 2 (2008) deal with aspects of the beach in relation to its ephemeral character of creation and destruction. I show how categories such as creation/destruction can become conflated or confused. Since creation is by definition an essential part of the artistic work, the artworks and the materials used in this group (ceramic tiles, that can be re-arranged) question not only the extent to which it is possible to critique creativity from within the artistic process, but also ask to what extent destruction is a necessary part of the creative process. I was also interested here in interrogating how the beach (in relation to narratives such as Robinson Crusoe, for example) can serve as a model for disturbing the creation/destruction relation. Moreno’s Straw (2008), 80 x 50 cm, oil on board. Untitled (Gautor), 2011, 24 x 30, oil on board. Untitled (Bruecke), 2011, 19 x 25,5, oil on board. 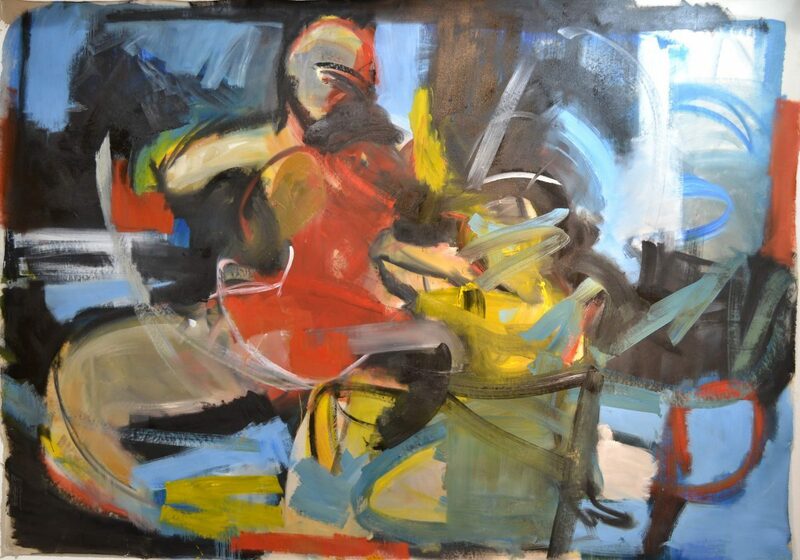 Untitled (Gaugasse), 2011, 30 x 30, oil on canvas. Untitled (Drusus Wall), 2011, 40 x 40, oil on canvas. Untitled (Leichhof), 2011, 40 x 40, oil on canvas. Untitled (Schillerpl. 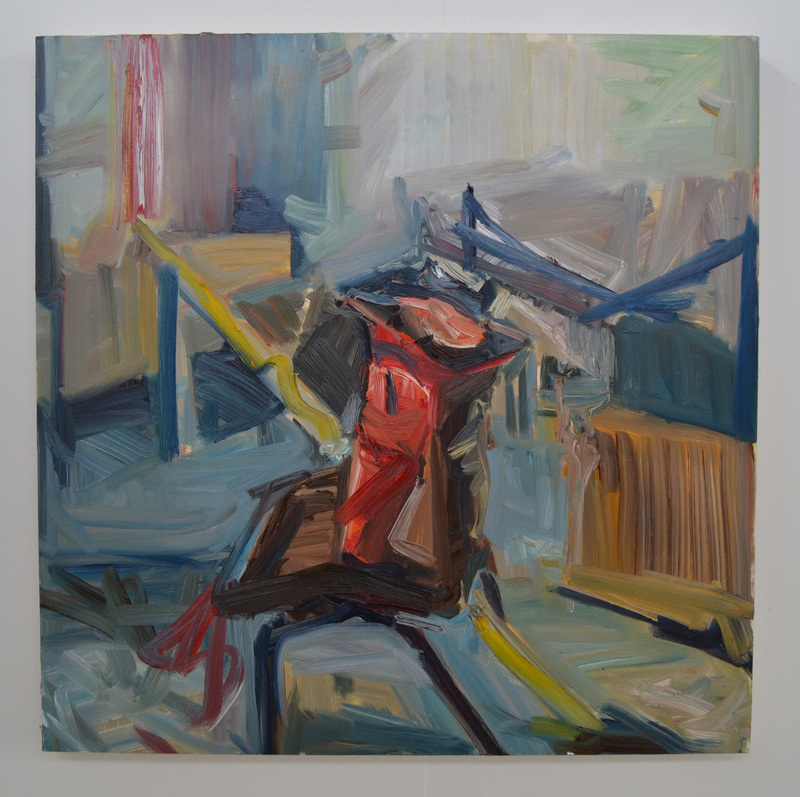 ), 2011, 40 x 40, oil on canvas. Objects 1, 2016, oil on aluminuim, 7,5 x 12,5 cm. House, 2016, oil on aluminuim, 14,5 x 18 cm. Bottle and can, 2016, oil on aluminuim, 17,5 x 7,2 cm. Orange, 2016, oil on aluminuim, 16 x 10,5 cm. Bottle, 2016, oil on aluminuim, 14,5 x 18,5 cm. Scissors, 2016, oil on aluminuim, 8,7 x 10 cm. Scissors, 2016, oil on aluminuim, 17,5 x 7,3 cm. 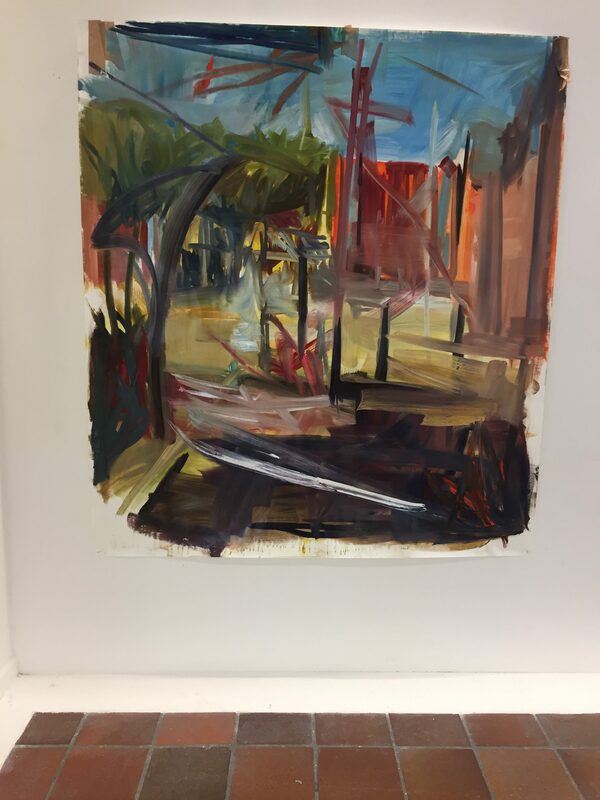 Composition, 2016, oil on aluminuim, 17,8 x 12,3 cm. Exhibition View, BePoet, Frankfurt Germany, 2018.